The Variety Telethon has a long fundraising history in many parts of the USA, Canada and Israel. It is without a doubt the highlight of all Variety events. A Telethon provides Variety and its donors the visibility that only TV can give. Donors who have made commitments and pledges throughout the year are invited to attend and will be acknowledged for their generosity on live television. At the same time the TV station receives recognition from viewers and advertisers for their commitment to the community and the special children it serves. Celebrities are also invited to participate, it gives them great visibility as they sing and dance and show that they care for our cause “helping children with special needs”. They donate their time and talent and their reward is knowing that they have made a difference in the life of a child. It is a rewarding and feel-good time for all involved. A typical Telethon can run anywhere from a few hours to several days, depending on the TV station and the Variety Tent in that community. This is a WIN – WIN event for all, the donors, the TV station, the celebrities and most of all the Children that Variety serves. Below is a recap of our 2015 Variety Telethon’s resounding success. Variety – The Children’s Charity of Buffalo and Western New York held their 53rd Annual Telethon on Sunday, March 22nd on WKBW-TV. The 12 hour long Telethon raised $1,131,029 to help sick, handicapped and underprivileged children in Western New York. The Telethon allows schools, VFW Posts, Unions, Corporations, Senior Homes, Volunteer Fire Companies, as well as year round fundraisers like the Car Raffle, Halloween Parties, Mr. Food Lunch, and many others to give their donation and be recognized by the viewership. The Credit Cards and Pledge Phones are vital to the successful Telethon and both National Talent and Local Hosts work very hard to insure all 60 phones stay busy. While it is difficult to pick a single highlight, Tent 7 showcases our Mobility Program by having a child ride one of the adaptive bikes across the long Grand Ballroom floor so the public realizes the success of the bike program. Variety – The Children’s Charity of Iowa held their Telethon on March 7 & 8, 2015 and raised $3,805,100. IOWA LOCAL ABC5 WOI-dt broadcast throughout Central Iowa, and a line-up of local, national and international personalities appear along with thousands of volunteers, individual donors and corporate donors, who give their time and money to support Iowa’s children. Hy-Vee, a Midwest grocery store chain, has partnered with Variety of Iowa since 1983, and has impacted Variety and Iowa’s children to the tune of more than $14 million during that time. VIPs are volunteers who work miracles before, during and after Telethon by individually raising thousands of dollars for the children. These individuals are the backbone of their Telethon fundraising efforts. VIP’s sit in the front row of the phone banks at telethon and are given the opportunity to recognize their donors during their on-air appearance. The dedication of Variety’s VIPs has consistently generated more than $1 million annually, by collecting pledges both large and small. Companies and organizations can support Variety’s annual Telethon by providing volunteers to appear on-air in the phone banks behind the VIP’s. The corporate phone panels (32 employees for a full panel and 16 for a half panel), are encouraged to promote their organization by wearing logoed apparel. Phone panel volunteers raise dollars prior to the weekend through fun events – jeans days, bakes sales, etc as well as through soliciting pledges from co-workers, friends and family. The organization does an on-air check presentation to Variety for the total amount donated by the company and raised by the employees. Some of the phone panels set a goal to raise enough funds to purchase a Variety Van, or to help fund bikes through the Mobility Program. In addition to drawing attention to their donors, the telethon provides Variety the opportunity to highlight the kids that will ultimately benefit from the dollars raised. Each year, Variety presents a number of specialized bikes to children during the telethon, as well as holding interviews with past grant recipients. The Variety telethon is broadcast live from the Grand Ballroom of the Community Choice Credit Union Convention Center at Vets Memorial Auditorium in downtown Des Moines. 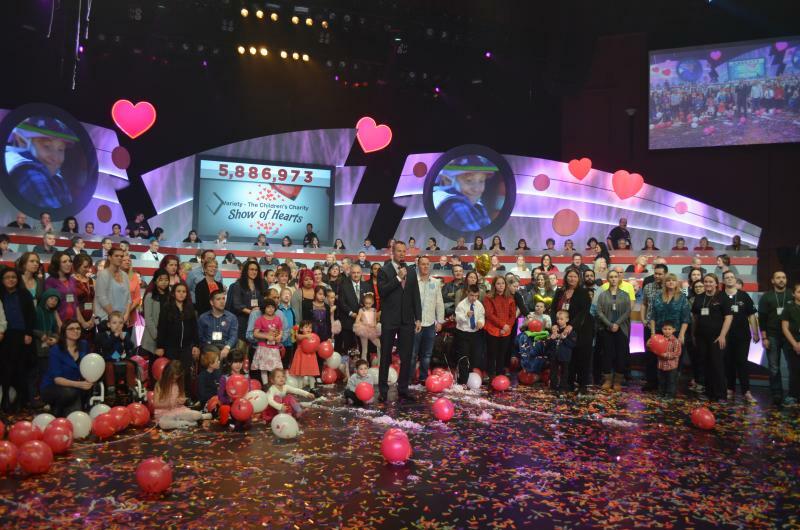 The 49th annual Variety Show of Hearts Telethon February 14 & 15 of this year was a resounding success, with generous donors across the Canadian province of British Columbia (B.C.) helping to raise $5,886,973 for children who have special needs. The two-day show featured heartwarming stories of children in B.C. helped by Variety, concerts showcasing the music industry’s biggest stars, and innovative ways for viewers to engage with the show – including winning a new car! Vancouver’s pre-eminent blogger Miss604 joined the team on-location this year, reaching out with live and interactive social media updates. As a result, the Show of Hearts trended on Twitter in Vancouver 15 minutes into the show and Variety in B.C. was trending by day two. In addition, a car giveaway where viewers had to answer questions online about the show helped to increase viewership this year. A big thanks to Ford Canada for their support! Variety of Israel’s Telethon was a huge success! It was aired on Channel 2 most viewed prime time (after the news), with huge exposure, and Israel superstars, singers, dancers, TV stars, many fans, and many Variety Israel friends and children in attendance in the Dhul Amphitheatre. The Telethon raised more than Seven Millions Israeli Shekels ($ 1,830,000).